Congratulations to Roberto Anesi, Best Sommelier AIS 2017! 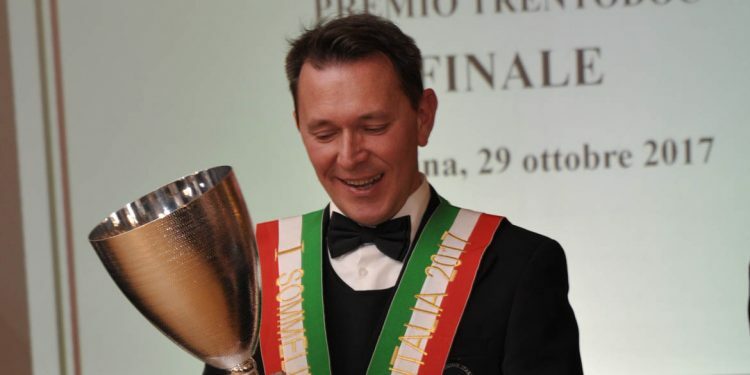 The owner of the El Paèl restaurant in Canazei (Trento), a true expert and friend (co-author of #abbinamentidifficili in every issue of Civiltà del bere), has been named national champion of the Italian Sommelier Association (AIS) after a brilliant final exam on Sunday 29th October in Taormina (Messina). The final stages of the Best Sommelier AIS competition saw Anesi face Massimo Tortora (AIS Tuscany), Andrea Sala (AIS Lombardy) and Carlo Pagano (AIS Molise). All the competitors showed great skill and expertise when dealing with the territories, producers and food pairing, as well as a test on serving and communication (also in a foreign language). Roberto Anesi was born in Trento in 1972. He is a sommelier, restaurant owner and wine writer (his blog is diariodivino.com). He has been a professional sommelier since 2006 (and speaker at AIS courses since 2008), but he started out in this sector much earlier, in 1997. He has attended training courses at important international institutes (such as WSET and Institute of Masters of Wine). He has collaborated with magazines in the sector and (recently) Wine TV. “Wines and his role as maître are his world. Don’t touch his Pinot Nero” is his brief biographical note among our authors. “This is a milestone, but definitely not the final destination. I will continue to go forwards,” commented a delighted Roberto Anesi just after the award ceremony. I have been working as a maître for 25 years and have been a member of AIS for 20. It is a great thrill and a huge satisfaction to bring this cup and sash to Trentino for the first time.” The final of the Best Sommelier AIS 2017 competition took place during the 51st edition of the AIS National Congress (held in Taormina this year).